Mild zinc deficiency can result in many diverse symptoms that may present in the healthcare practice and the multitude of zinc functions in the body suggests a number of important roles in health maintenance. Normal childhood growth, immune system function, tissue repair, macular integrity, and clear skin all depend on adequate zinc nutrition. 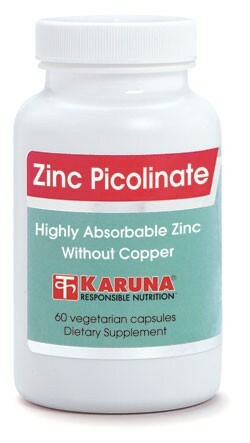 Zinc Picolinate provides a highly absorbable form of zinc, allowing for reduced doses while maintaining effectiveness. Zinc Picolinate Plus provides copper for safe long-term use, while a copper-free formula is also available for short-term use or when copper is not desirable. Suggested use for adults: One capsule per day, or as directed. This product should not be taken for more than one month without supervision because it contains no balancing copper.